Most of our well known and regular winter birds are back in town as it were. Our daily visitors include House Sparrows, Hairy and Downy Woodpeckers, Chickadees and Redpolls with Pine Grosbeaks and Bohemian Waxwings making sporadic visits to our fruit trees that still have some fruit hanging on them. What is unusual is the total absence of Red and White Breasted Nuthatches which have been very regular winter visitors in the past but, then again, there is still a lot of winter left. The lack of nuthatches has not been the only unusual thing this winter. One day we watched a female Downy Woodpecker raising the dickens with the House sparrows and Chickadees. When ever one of these birds came even near the feeders she would fly at them making strange sounds and chasing them off. 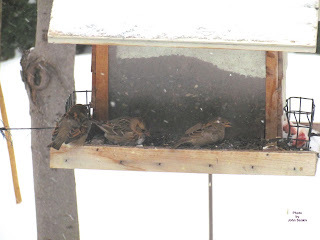 Neither the sparrows nor the chickadees were overly scared but they did stay out of the way. When a male Hairy Woodpecker showed up the Downy was not pleased and kept harassing the larger bird but from a few feet away. It was interesting to watch the Downy spread her wings, fan her tail and make all sorts of threatening un-woodpecker-like sounds at the unconcerned feeding Hairy. Eventually the Hairy flew off closely followed by a very feisty female Downy. On Dec. 16 we drove out to the family farm 15 miles south of Wynyard to show our young visitor from Ukraine where I grew up. As we drove down the lane a rather large bird was running on the road just ahead of us. I assumed it to be a Grey Partridge but when it flew up it turned out to be a Mourning Dove. Again, very unusual. While we were visiting family in Humboldt just before Christmas we were shown a recently taken picture of Robins feeding in the snow covered yard of one of the neighbours. Although not unheard of, this is one event I would have liked to have seen simply because I have never seen a Robin in winter before. Another unusual event in our yard is the presence of a juvenile Harris Sparrow. Harris Sparrows are migratory but this one is still here feeding with the House Sparrows. The juvenile lacks the black face and throat of the adult but has a sloppy black breast spot instead. The pinkish coloured bill and yellowish face provide all the needed field marks to identify the bird and easily separate it from the somewhat similar House Sparrows. 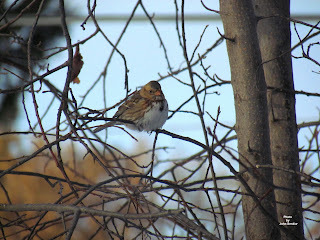 This week's photos, taken this past December, are of a juvenile Harris Sparrow sitting in a Chokecherry tree in our backyard and the same bird feeding on black oilseed amidst a flock of House Sparrows. The Harris Sparrow is the one in the middle.